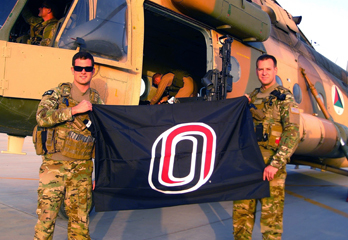 UNO greatly appreciates the dedication of our many students who continue to serve on active duty, guard, or reserves while pursuing their education. Your choice to serve should not negatively impact your academic progress at UNO. If your military service leads to a deployment, activation, or extended TDY that impacts your UNO classes, we have a Deployed Student Program and Military Service Policy to help you, as you may be eligible for accommodations. If you find yourself in this situation, please contact the UNO Deployment Coordinator immediately to discuss your options. Depending on your unique situation, you may want to pursue a class withdrawal, an incomplete, other alternate class arrangements (at instructor’s discretion), or continue classes online. UNO can also help you get re-enrolled when you return from your military service, including setting up priority registration. The Office of Military and Veteran Services will need a copy of your orders to officially set up any of these options. Many military students choose to take classes online while they are deployed. UNO has a wide variety of courses and entire degree programs available online. Discuss this option with your academic advisor, if you’re interested. The UNO faculty teaching online classes are typically very supportive of military students in their classes. However, if you are taking online classes while deployed, we would like to connect with your professors to make sure they are aware of the Internet and schedule conflicts you may experience while in a deployed location. Contact the UNO Deployment Coordinator if you will be taking online classes while deployed, activated, or on TDY.